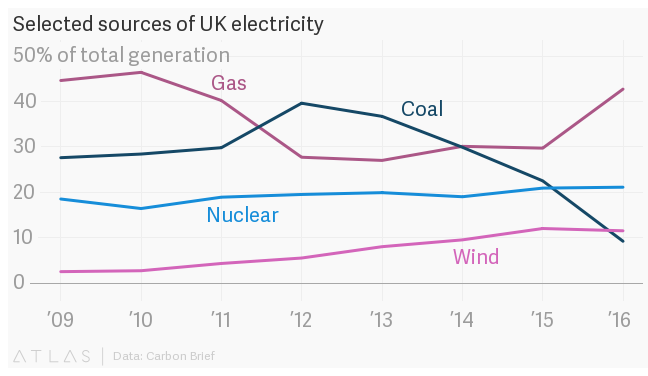 During most years since the industrial revolution, the UK has relied on coal to produce the lion’s share of its energy (in the past 10, gas has been top some years, and coal others). But in just three years the dominance of the most polluting energy source has declined to such an extent that full-year figures for 2016 show it was overtaken by wind power for total power generation. Since its recent peak in 2012, when coal was the biggest single source of power in the UK, the fuel has seen a 78% drop in terawatt hours of generated power. Wind generation almost doubled in the same time period, according to analysis by Carbon Brief, a UK-based research and journalism organization. The change is momentous, and by no means accidental. European policy has mandated for the closing or retrofitting of many coal plants, with the UK recently announcing all its plants would close by 2025. Some plants, like the UK’s Drax, the biggest coal power station in Europe, have responded by moving to the burning of wood—which has its own issues. The replacement of coal with cleaner ways of generating power is a key part of the global effort to fight climate change. In most countries with large populations, renewables still can’t provide enough constant “baseload” power to allow them to replace older technologies. Many countries, the UK included, are therefore moving heavily from coal to gas. Gas is still a fossil fuel, but it’s much less damaging to the environment than coal, so planners hoping to deploy more renewables can use it as a “bridge” to an even cleaner future. Other countries, like France, have invested heavily in nuclear as a means to move away from emissions-heavy power. The US, the world’s second-biggest polluter after China, has also begun a significant move away from coal. In 2015, for the month of April, coal was not the main source of electricity in the US for the first time in its industrial history. Extrapolating from available data shows that’s likely to be true for the whole of 2016 as well. And for its part, China is investing massively in renewable energy. It’s still heavily reliant on coal power, but it overtook all other countries to become the biggest spender on renewable technology in 2014, and recently pledged to spend $361 billion on the technologies by 2020.